A groin strain is a tear of the adductor muscles on the inside of the thigh. A sudden sharp pain is felt which can range from a mild to very severe. The main symptom of a groin strain is sudden sharp pain on the inside of the thigh. It can be either in the belly of the muscle, or higher up where the tendon attaches to the pelvis. Often pain is felt when sprinting or changing direction quickly. The athlete may or may not be able to play on depending on how severe the injury is. Although there is often swelling as a result of a groin strain, this is often not visible to the eye. Groin strains are graded 1, 2 or 3 depending on the extent of the injury. A Grade 1 strain is a minor tear where less than 25% of fibers are damaged. You will most likely have discomfort in the groin area, but be able to walk with little or no pain. Often it is not possible to recall the exact point of injury as pain may only be noticeable after exercise. If you press into the muscle it may feel tight or tender. Stretching the groin muscles may also reproduce pain. Fast, explosive movements are mosts likely to trigger pain. A Grade 2 injury is a moderate tear which involves damage to more than 25% of fibres. You will often know when the injury occurred from a sudden sharp pain in the groin during exercise. Bruising and swelling will develop over the next few days, but will not always be visible. Attempting to contract the muscle against resistance will be painful. This is easily tested by squeezing a ball between your knees. Pain will also be felt on stretching the groin muscles. Grade 3 groin strains are the most serious. They involve either a complete (100%) or almost complete rupture of the muscle. You will feel severe pain at the time of injury and be unable to continue. Contracting the groin muscles will be impossible from a combination of pain and weakness. Substantial swelling and bruising will usually develop around the inner thigh area and this may become visible within 24 to 48 hours. Range of motion – Testing the range of motion available at the hip joint or stretching the suspected injured muscles may reproduce symptoms. By identifying which movements are most painful, your therapist can deduce which muscles/tendons may be injured. Moving the leg out to the side (away from the body into abduction) stretches the groin muscles and can give an indication about flexibility. In a healthy athlete, both legs should be equal in terms of degree of stretch or flexibility. Resisted Muscle Tests – These involve the therapist applying resistance as the patient takes the injured leg through a range of movement. Muscle tests should be done with your leg in different positions to isolate individual muscles. If you feel pain on any particular movement, this indicates the type and location of your injury. Imaging – An Ultrasound scan or MRI may be used to confirm the diagnosis where available. 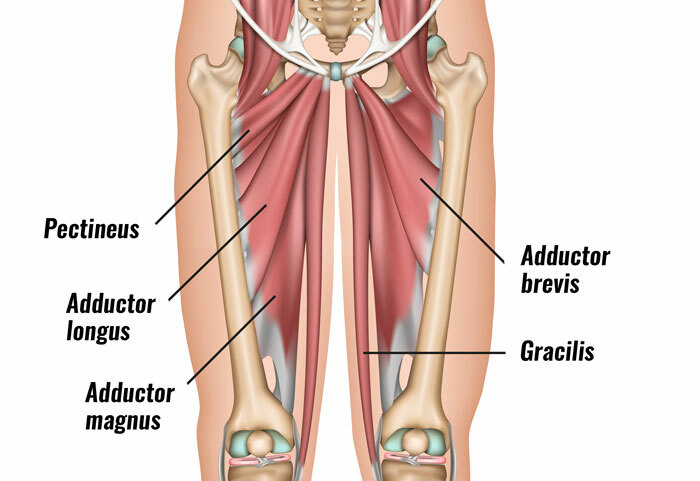 There are five groin (adductor) muscles. Three of them are called the ‘short adductors’ (pectineus, adductor brevis, and adductor longus). The other two are known as the ‘long adductors’ (gracilis and adductor Magnus). What do the adductor muscles do? The main function of the adductor muscle group is to pull the leg back towards the midline. This movement called adduction. The adductor muscles also stabilize and control the pelvis during most activities including walking, running, sprinting, playing football, horse riding and hurdling. They are especially important in any sport which requires rapid changes in direction. The adductor muscles on one side keep the pelvis level while the adductor muscles on the opposite side are used to move the leg. What causes groin muscle strains? Groin strains usually occur when sprinting or changing direction quickly or during rapid movements of the leg against resistance such as kicking a ball. Overstretching the muscle such as in martial arts high kicks can also cause a torn adductor muscle. There is likely to be damage to more than one structure in sudden onset or acute groin strains(1). The Sportsinjuryclinic.net groin strain rehabilitation program is based on four strands or pathways of treatment (ice, heat, massage etc), stretching, strengthening and maintaining fitness. Each injury and each athlete is different and will start at a different point, and also progress at different rates. Apply the P.R.I.C.E principles (protection, rest, ice, compression, and elevation) as soon as possible after the injury and for the first 72 hours. A cold therapy and compression wrap will help stop internal bleeding, reduce pain and swelling speeding up the healing process. Wearing a groin support or groin strapping (see below) is also useful in the early stages in order to minimise pain and support the muscle while it heals. The use of groin supports and compression shorts is useful to protect and support the muscle when returning to training. After the initial acute stage, a progressive stretching and strengthening exercise program is advised to ensure the muscle regains pre-injury levels of strength and flexibility and is, therefore, less prone to re-injury. What can a professional therapist/doctor do? A professional therapist will assess the injury and make an accurate diagnosis. Electrotherapy modalities such as ultrasound may be used to aid the healing process. A doctor may prescribe NSAID medication such as Ibuprofen (do not take if you have asthma) to help with pain and swelling. Strapping the groin can aid healing by applying compression to the area immediately after injury. This is part of the PRICE principles of protection, rest, ice, compression, and elevation. It can also protect and support the muscles during rehabilitation and help prevent further damage to the injured muscle. A 7cm or 10cm elastic or elastic cohesive bandage and 2.5cm nonstretch zinc oxide tape is required to finish it off. To strap the groin start on the inside of the thigh to be supported wrap once around the thigh applying tension across the front and upwards of the groin. Pass the bandage around the back of the waist and around to the front. Then pass the bandage around the back of the thigh and around the groin once more applying tension to the front and upwards on the groin. Again, pass around the back and repeat this as required or until the bandage runs out. Follow the same pattern with a roll of 2.5cm zinc oxide tape. Start on the inside of the groin, pass around the thigh applying tension as the tape comes around the groin and up the front of the thigh. Pass the tape around the back of the waist, across the front and then back around the thigh to the start. Sports massage may be beneficial once the acute stage has passed (after 72 hours) by releasing tension in the muscle and encouraging blood flow and nutrients. Caution is advised as massaging an injury too soon may increase the bleeding and may make the injury worse. Stretching should always be pain-free starting with gentle static stretches where the athlete eases into the stretch and hold for up to 30 seconds, repeating five times a day. Long adductor stretch (legs straight), short adductor stretch (legs bent) and hip flexor stretching should be done ensuring all groin muscles are stretched. These are progressed as the muscle heals to more dynamic exercises which involve movement or swinging of the leg. Do not start stretching too early as the healing of the muscle may be compromised (not before day 5 post-injury). Read more and watch videos on stretching exercises. 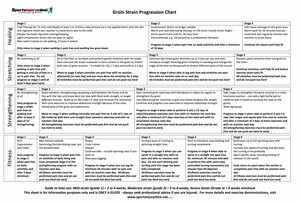 The aim to gradually increase the load that is put through a muscle and can start as early as day 5 as long as they are low-level and pain-free. Isometric or static exercises are advised first and do not involve any movement of the muscle. For example, squeezing a medicine ball between the knees, or using a partner or therapist for resistance. Eccentric exercises are more advanced exercises which focus on strengthening the muscle whilst it lengthens rather than shortens as all the previous exercises have done. A therapist or partner is needed to assist with this one. Dynamic exercises with a resistance band are performed as the muscle gains in strength. Straight leg raise and more advanced adduction exercises using gravity or resistance bands are done as pain allows leading on to even more dynamic and sports specific exercises which involve running, change of direction drills, hopping, and plyometric exercises. These bridge the gap between rehabilitation exercises and returning to full training and competition. For a detailed list of strengthening and functional exercises read more and watch videos on groin strain exercises. Serner A, Tol JL, Jomaah N et al. Diagnosis of acute groin injuries: a prospective study of 110 athletes. Am J Sports Med 2015;43(8):1857–64.